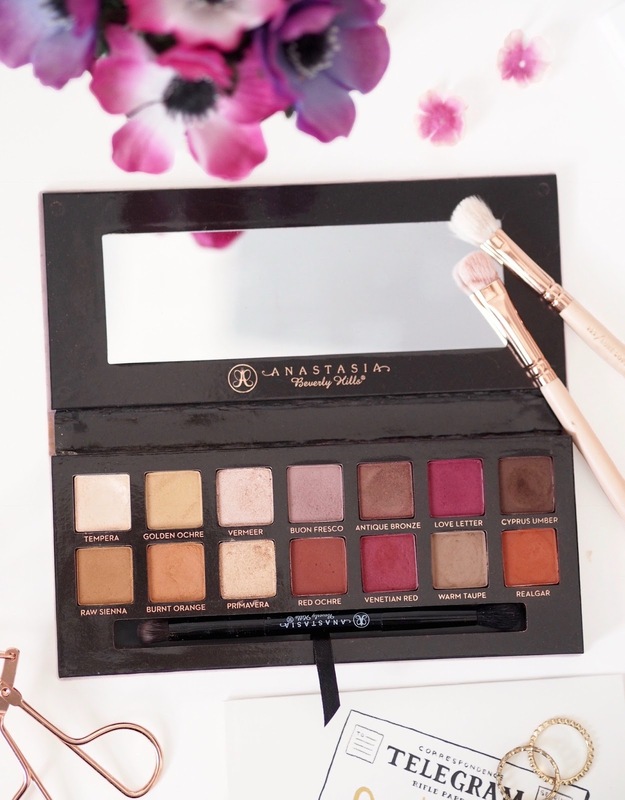 The Anastasia Beverly Hills Modern Renaissance palette has been raved about just about everywhere since it’s release last year. I think it’s been one of the most hyped up palettes for a long time now and it seems like everyones featuring it in tutorials and makeup looks which meant it quickly sold out and was hard to get hold of for a while. Me being the makeup addict I am got my hands on this palette shortly after it’s release and as I haven’t actually spoke about it much on my blog I thought it was time I dedicate a post to it and share if I think it’s really worth the hype. I’m a massive warm toned lover, I also happen to be a big ABH eyeshadow fan so I knew I needed to own this from the moment I saw preview photos popping up on social media. 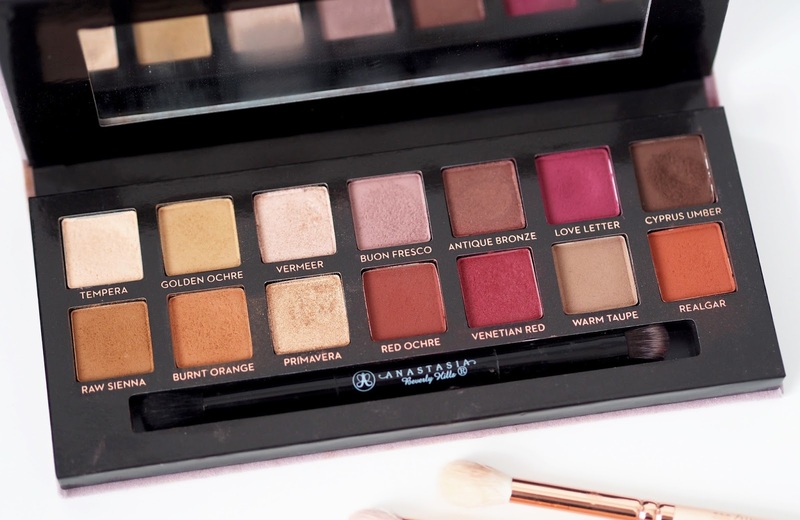 The thing that really stood out with this palette is the super warm berry red tones it features as there’s not actually many palettes (besides custom made like Makeup Geek/Ingot/MAC etc) on the market with those tones, ABH saw a gap in the makeup market and I think that’s why this palette has blown up so much. The palette contains 14 shades from your everyday more wearable shades on the left side then it goes up to the brighter warm reds and even an orange. You’ve got a mix of mattes and shimmers with most being matte, I like that fact about this palette as I find a lot of brands opt for more shimmers. If I had to be picky I would say this palette didn’t need both Raw Sienna and Burnt Orange as they are very similar shades but if I had to pick my favourites I’d say Vermeer, Antique Bronze, Love Letter and Cyprus Umber. I really like the quality of all the shadows in this palette. All the shades are pigmented and they’re really easy to blend on the eye. There’s certainly a variety of looks that could be created with this palette. The only thing I have noticed is that a couple of the shades have a little more fall out than others but that doesn’t bother me as I do my eye makeup before my base so I can simply sweep fall out away. Vermeer and Primavera are such beautiful shades, I like to mix them with a bit of setting spray and they go on more like more of a metallic shadow all glowy and perfect which I LOVE. Packaging wise whilst it may look beautiful (gimme all things pink) I must admit it’s not the most practical. The light pink/mauve velvet does get dirty very easily which whilst it’s not something that bothers me too much, it’s something to bare in mind especially if you travel with your makeup – you can already see the stains on mine in the picture above! Whilst you can wipe the marks away to a certain extent, it’s just never going to be as clean as it originally was. This palette is not cheap, especially for Anastasia Beverly Hills! I have a couple of their palettes now and I remember only paying £20-£30(ish) for them so this being £41 makes it a lot more but then you are getting more shadows. I actually ordered it from Beautylish which was $42 so when converted to pounds I ended up paying a bit less. When you compare it to palettes from brands like Too Faced and Urban Decay then it’s on the same price level as them, but considering you’re getting 14 shadows it works out to be just under £2.95 a shadow which makes the palette a lot more reasonable when you look at it like that. So do I think it’s worth the hype? Yes I do if you’re a fan of the brighter berry/red toned looks you could create with these shades. If you’re buying this only for it’s more neutral shades then I think there’s certainly different palettes out there for you. I can’t say I find myself reaching for this palette daily (the fact I own way too many palettes already means I’m often switching it up) but I am glad to have it in my collection. I have used it in a few of my Instagram makeup looks which I’ll link here (1, 2, 3, 4, 5) and I just love how the colours go so well with my green eyes. I can say this palette does get my approval! 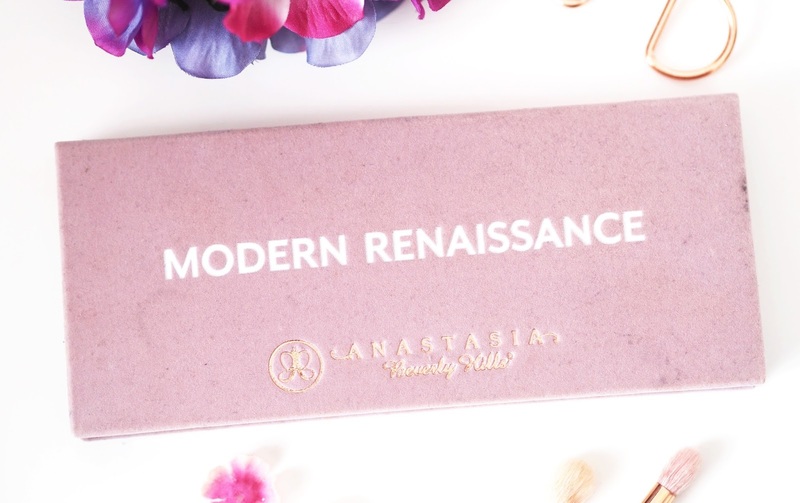 Have you tried the Modern Renaissance Palette, if so do you think it’s with the hype?